One of the challenges when imaging the breast is to distinguish benign lesions from those that are malignant. With ultrasound, which is safer than ionizing X-rays and more compact and affordable than magnetic resonance imaging (MRI), the images can often be difficult to interpret. A team of scientists from ETH Zürich, led by electrical engineer Orçun Göksel, has just published a paper in Physics in Medicine and Biology that demonstrates a new method for detecting breast cancer. Their prototype, which is based on measuring the speed of sound (SoS), would appear to show great promise. Because bodily tissues and organs have different physical properties such as density and stiffness, the sound waves emitted by an ultrasound probe are reflected differently. 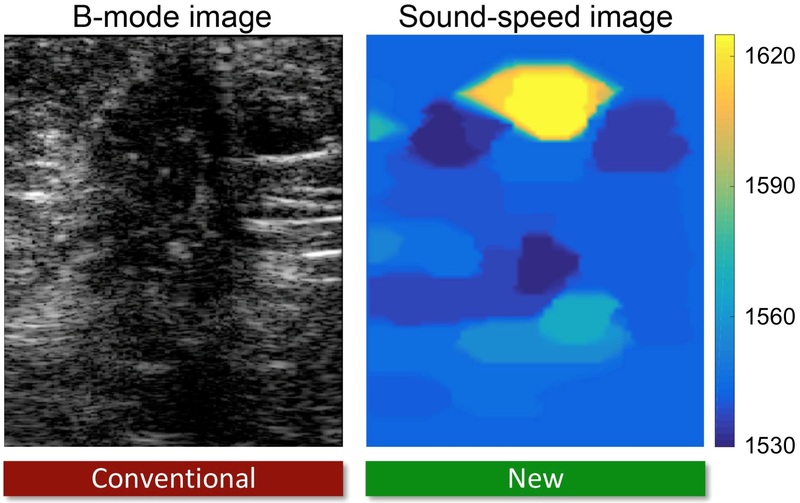 An ultrasound image is generated by measuring the intensity of the sound waves that are reflected, but the Zürich team also captures an additional parameter – the echo duration. Since the depth of penetration is known, and speed is simply distance divided by time, the SoS can be calculated. Breast lesions are more rigid (i.e. stiffer) than the surrounding tissues, meaning that sound travels 1.5% faster in benign tumours and 3% faster in malignant tumours. Because the measurement of SoS is based on software, the technique can apparently be used with any ultrasound equipment. As is evident from their recently published paper, the mathematics that is required to measure SoS is not trivial, and the researchers have applied for patents to protect their valuable intellectual property. There is another system for detecting breast cancer that uses SoS – SoftVue from Delphinus – but it employs a custom ring transducer and measures SoS based on transmitted rather than reflected ultrasound waves. Göksel and his team are currently looking to commercialise their technology. He is enthusiastic about its potential, saying: “Any physician’s office can accommodate a compact handheld probe. Our technology preserves these advantages while addressing the main limitation of conventional ultrasound – image quality – which is still a problem for diagnosis in many clinical cases.” As indicated in the title, it’s all about speed. Final Court of Appeal is under a microscope! A Combo D B T(D 3) AB US will be able to disclose up to 95% of all early breast cancers in women with and without dense breast tissue. Such findings will be hard to reduplicate !